شهر رشت مرکز استان گیلان و یکی از کلان‌شهرهای ایران در حاشیه جنوبی دریای خزر به شمار می‌آید. از دیدگاه زمین‌شناسی، این شهر در شمال پهنه ساختاری البرز و در پهنه رسوبی گرگان- رشت جای گرفته است. گسل‌های بسیاری در این منطقه وجود دارند و تأثیر‌گذارترین آنها، گسل خزر است که می‌تواند بیشینه شتاب لرزه‌ای معادل g 3/0 را برای یک زمین‎لرزه بزرگ به وجود آورد. با استناد به داده‌های ژئوتکنیکی به دست آمده از حفاری‌های اکتشافی، خاک‌های محدوده شهری در مسیر خط 2 مترو شامل تناوبی از سیلت و رس و میان‌لایه‌هایی از ماسه و شن هستند. با توجه به بالا بودن سطح آب زیرزمینی، فراوانی نهشته‌های ریزدانه، لرزه‌خیزی بالای منطقه و همچنین تولید ارتعاش توسط حرکت قطار مترو، امکان بروز خطر پدیده روانگرایی در مسیر ساخت مترو پیش‌بینی می‌شود. بر این مبنا، هدف مقاله ارزیابی خطر روانگرایی در مسیر خط 2 متروی شهر رشت از راه تهیه نقشه پهنه‌بندی تعیین شده است. در این راستا با استفاده از اطلاعات 14 گمانه اکتشافی حفر شده تا ژرفای بیشینه 40 متر از سطح زمین و با بهره‌گیری از نرم‌افزار ArcGIS و به‌کار‌گیری روش تحلیل سلسله مراتبی فازی، پهنه‌بندی خطر روانگرایی انجام شد. لایه‌های اطلاعاتی مورد توجه در این پژوهش شامل نوع خاک، عدد آزمایش نفوذ استاندارد، ژرفای گمانه‌ها (فشار روباره)، شاخص خمیری و بیشینه شتاب لرزه‌ای بوده‌اند. نتایج به دست آمده نشان می‌دهد که خطر روانگرایی در مسیر خط 2 مترو، میان کم تا خیلی زیاد متغیر است و بیشترین خطر در ایستگاه BC2 (محدوده کوی سازمان آب) و I2 (محدوده حسین آباد) پیش‌بینی شده است. تأثیرگذارترین عامل در بروز خطر روانگرایی جنس خاک و شرایط آب زیر زمینی بوده است. Rasht City is capital of Gilan Provence and is considered as one of the metropolitans along the south coast of the Caspian Sea. In terms of geological setting, the city is situated to the north of the Alborz Mountains and in the Gorgan-Rasht sedimentary zone. The area is characterized by many active faults, with the Khazar fault being regarded as the most effect one, which can produce a gravity acceleration of 0.3g for a major earthquake. According to geotechnical data from exploration boreholes, the ground surface along Line 2 of Metro in the city comprises mainly a sequence of silts and clays with interlayers of gravel and sand. Due to high level of groundwater table, abundance of fine-grained soils, high seismicity potential, and production of ground vibration during movement of the train, liquefaction can be expected to occur along the Metro line. The aim of this paper is therefore to evaluate the liquefaction hazard potential along the Line 2 of Metro of the Rasht City by preparing a hazard zonation map. Liquefaction hazard zonation mapping was carried out using data gathered from 14 exploration boreholes drilled to a depth down to 40 meters integrated into Analytical Hierarchy Process (AHP) in the GIS modelling system. In this regards, five layers of information including soil type, SPT number, overburden pressure, plastic index and maximum gravity acceleration were considered. The results indicate that the range of liquefaction hazard varies between low to very high, and the maximum rate of liquefaction is expected in BC2 and I2 stations (Sazeman-e-Ab and Husain Abad areas, respectively). Soil type and groundwater table are recognized to be the most effecttive agents in inducing potential liquefaction. آقانباتی، س. ع.، 1385- زمین‎شناسی ایران، سازمان زمین‎شناسی و اکتشافات معدنی کشور، 564 ص. افتخارنژاد، ج.، 1359- تفکیک بخش‌های مختلف ایران از نظر وضع ساختمانی در ارتباط با حوضه‌های رسوبی، نشریه انجمن نفت، شماره 82، صص. 19 تا 28. حائری، م.، 1369- مطالعه مقدماتی پدیده روانگرایی در منطقه گیلان بر اثر زلزله 31 خرداد 1369 منجیل- رودبار، مؤسسه زلزله‌شناسی، 75 ص. حجتی، م.، ارومیه‌ای، ع. و قنبری، ع.، 1393- تحلیل خطر زلزله با نگرشی بر پروژه‌های مترو ریلی (مطالعه موردی خط 2 متروی تبریز)، پنجمین کنفرانس مکانیک سنگ ایران. حیاتی، م.، ارومیه‌ای، ع. و قنبری، ع.، 1392- بررسی ناپایداری تونل خط یک قطار شهری اهواز با کمک نرم افزار Arc-GIS و مدل حساسیت نسبی، چهارمین کنفرانس ملی زلزله و سازه، جهاد دانشگاهی استان کرمان. صص. 128 تا 134. حیدری شیبانی، ر. زارع، ش. میرزائی نصیرآباد، ح. و فروغی، م.، 1391- بررسی تأثیر فشار جبهه‌کار بر نشست سطح زمین در تونل‌سازی مکانیزه در زمین نرم- مطالعه موردی: تونل قطعه شرقی- غربی خط 7 متروی تهران، نشریه مهندسی تونل و فضاهای زیرزمینی، دوره 1، شماره 1، صص. 57 تا 68. خبازی، ا.، خامه‌چیان، م. و اصغری، ا.، 1391- بررسی پدیده روانگرایی در رسوبات آبرفتی مسیر تونل متروی تبریز، دهمین همایش انجمن زمین‎شناسی ایران، تهران، دانشگاه تربیت مدرس، صفحه 5-67. درویش‌زاده، ع.، 1370- زمین‌شناسی ایران. مؤسسه انتشارات امیرکبیر، تهران. سعیدی، م.، موسوی، م. و نژادشاه‎محمد، م. ، 1392- ارزیابی سامانه نگهداری تونل خط متروی تهران در تقاطع غیر هم سطح با تونل توحید و تونل خط 7 متروی تهران در برابر بارهای دینامیکی ناشی از زلزله، نشریه مهندسی تونل و فضاهای زیرزمینی، دوره 2، شماره 1، صص. 1 تا 11. شیرمرد، ح.، بحرودی، ع. و عادلی، ا.، 1394- روش تحلیل سلسله مراتبی فازی در سامانه اطلاعات مکانی به منظور تعیین نقاط بهینه حفاری در کانسار مس پورفیری نیسیان، فصلنامه اطلاعات جغرافیایی، دوره 24، شماره 93، صفحه 91 تا 100. قبادی، م. ح. 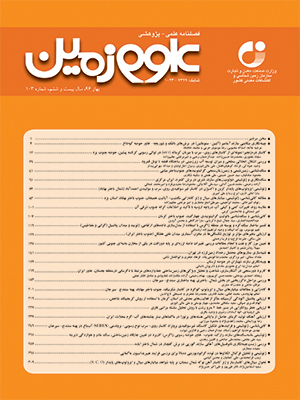 و بابازاده، ر.، 1391- بررسی‌های زمین‎شناسی مهندسی در مسیر خط 2 متروی تبریز به منظور ارزیابی نشست سطحی زمین، نشریه زمین‎شناسی مهندسی، دوره 6، شماره 2، صص. 1501 تا 1524. مرکز تحقیقات راه، مسکن و شهرسازی، 1393- آئین‌نامه طراحی ساختمان‌ها در برابر زلزله، استاندارد 2800، ویرایش چهارم، نشریه شماره ض-253، مجموعه استانداردها و آئین‌نامه‌های ساختمانی ایران، 212 ص. نبوی، م. ح.، 1355- دیباچه‌ای بر زمین‎شناسی ایران، انتشارات سازمان زمین‎شناسی کشور، 109 ص.
Alavi, M., 1996- Tectonostratigraphic lynthesis and structural style of the Alborz mountain system in northern Iran. journal of geodynamics, 21(1), pp.1-33. Chou, H. S., Yang, C. Y., Hsieh, B. J. and Chang, S. S., 2001- A study of liquefaction realted damages on shield tunnel, Tunnelling and Underground Space Technology, vol. 16, issue (3), pp: 185-193. Coch, N. K., 1995- Geohazards, Natural and Human, Prentice Hall, New Jersey, 481 pages. Hamshemi, M., Nikoudel, M. R., Hafezi Moghaddas, N. and Khamehchiyan, M., 2014- Engineering geological conditions of Holocene sediments of Anzali area, South Capsian Sea, North Iran, Arabian Gournal of Geosciences, vol. 7, iss. 6, pp:2339-2352. Hunt, R. E., 1984- Geotechnical engineering investigation manual, McGraw hill Book compny, 983 pages. Jie, Y. U., 2014- Hazard of sesmic liquefaction for metro tunnel structural engineering and countermeasures, Gournal of Railway Engineering Society, vol. 31m issue (2), pp:115-118, China. Moinfar, A. A. Naderzadeh, A. and Nabavi, M. H., 2012- New Iranian seismic hazard zoning map for new edition of seismic code and its comparison with neighbor counteries, Proceeding of 15th World Conference on Earthquake Engineering, Lisbon, pp: 181-191. Mondal, S. and Maiti, R., 2014- Integrating the analytical hierarchy process (AHP) and the frequency ration (FR) model in landslide susceptibilty mapping of Shiv-Khola watershed, Darjeeling Himalaya, International Journal of Disaster Rick Science, vol. 4, issue 4, pp: 200-212. Moradi, M., Bazyar, M. H. and Mohammadi, Z., 2012- GIS-based landslide susceptibilty mapping by AHP method, a cas study, Denat City, Iran, Journal of Basic and Applied Scientific Research, vol.2 issue 7, pp: 6715-6723. Saaty, T. L. And Vargas, I., 1991- Prediction, projection and forecasting. Kluwer Academic Publishers, Dordrecht, 251 pages. Samadi, L. and Mehrabi, B., 2009- Shallow subsurface geology and Vs characterstics o sedimentary units throughout Rasht City, Iran, Annals of Geopgysics, vol.52, no. 2, pp: 149-166. Stocklin, J., 1968- Structural history and tectonics of Iran, American Association of Petroleum Geologists, Bulletin V.52, No. 7, PP: 1229-1258. Talkhablou, M., Fatemi Agda, M., Motamedi, M. and Mehregan, Z., 2015- Evaluation of liquefaction potential in Bandar Imam Khomeini quaternary deposits, Quaternary Journal of Iran, vol. 1 no.1. Unutmaz, B., 2014- liquefaction potential of soils around circular double tunnel, Bulletin of Earthquake Engneering, vol. 14, issue 2, pp: 391-411. Wair, B. R., DeJong, J. and Shantz, T., 2012- Guideline for estimation of shear wave velocity profiles, PEERC Publication, University of California, Berkeley, 68 pages. Zare, M., 2012- Development of seismic hazard zoning map for Iran, bsed on new seismic source determination, Proceeding of 15th World Conference on Earthquake Engineering, Lisbon, pp: 232-241.